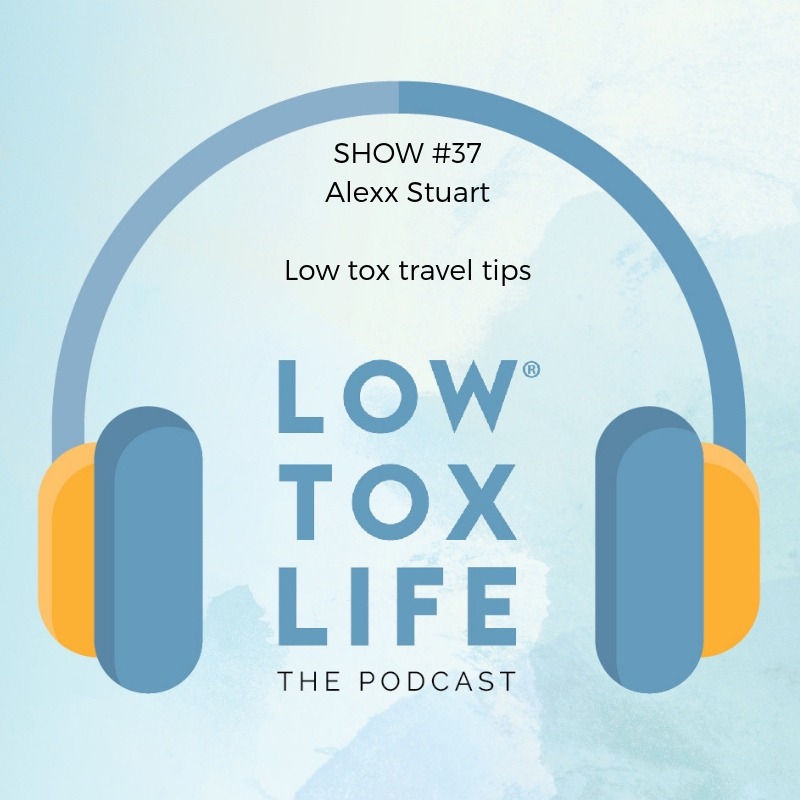 After my recent travels, I have been asked a load of questions over and over again about travelling low tox. So? It’s just me this week and I’m sharing my best low tox travel tips when it comes to food you can and can’t take aboard, movement, preventing swelling, indispensable products to take with you and sustainable choices you can make to save on single-use plastics. By the end of this show, you will be brimming with ideas to make your next travels more sustainable as well as knowing not how to look like a pale grey puffer fish with scaly skin – nobody needs that, right? Magnesium Spray or roll on – I like the roll on because it’s under 100ml and great for international travel. Magnesium deficiency is rife and if you have a dodgy tummy, sometimes it won’t be well absorbed, so transdermal (through the skin) is where it’s at. A spray on pressure points – wrists, back of neck, back of knees, is where you’ll get the fastest uptake. It relaxes and energises at the same time, so it really helps with the ‘scatty feelings’ vibe of traveling and settling in. My favourite travel essential oils. Vetiver (calming nerves on plane), Rosemary (work focus when time is limited at the computer), Peppermint (energy pick me up), Frankincense (skin support with a drop in moisturiser), Digize (after meals a drop on the tummy, so good!) and the Tranquil roll on (I roll it on my bed pillow) are my favourite travel oils if I have to whittle things right down. You can use whatever you fancy by way of oils, and I’m certainly not going to start mentioning oils every 3 seconds to you, but seeing as we’re on topic, I use the Young Living range because of their seed to seal assurance and commitment to owning many of their farms, farming biodynamically and distilling in house rather than buying oils on the open market and whacking a pretty label on them. I’m a sucker for romance and nerdiness and they deliver in spades on both the brand story and the science front so voila… if you fancy getting a wholesale account my member number is 2450874 and you can just pop over to the YL Aussie website and join. I highly recommend one of the premium starter kits (I love the dewdrop diffuser) and essential rewards. That’s what I do. Once you’re all set I’ll be notified and I shall pop you in our oily chat group to learn how to use the virtual office and how the oils can best support you. Really lovely safe uses and support – no internet doctor crazies talking ingestion etc. If you do open an account, rest assured I place zero expectation on anyone to start a business or be a ‘leader’. It’s just an oily appreciation group and a lovely bunch of peeps at that. Make a cake loaf / cheese bikkies / nourishing cake / anzac biscuits or coconut cupcakes for the journey and cool completely before putting into an airtight container. These will be fantastic to boost meal times, or stave off hunger in an airport / train delay. They will keep fresh for 4 days, no problems, and if you’re staying in an apartment with a kitchen, you could even freeze the leftovers (except the biscuits) for the next time you’re traveling. Cherry tomatoes, Carrot and celery sticks – These will keep fine for a couple of days while traveling and are great to have for raw, fresh food – something definitely lacking on the travel front! Make a round of smoothies and freeze them the night before traveling. Keep in large container as it will defrost much more slowly, and this will be cold for a good 6-7 hours after you leave home – note, for international travel there’s the 100ml liquid rule, so this is better for ground travel or if you’re travelling early in the morning to pack for the airport breakfast on the run. This chocolate breakfast shake is perfect for that. Pack some dehydrated crackers, that you can find at a health store. Pack a small jar of fermented veggies. Fermented / cultured veggies are wonderful for keeping the digestion going during long periods of sitting down and keeping your good bacteria aplenty, which while traveling means less chance of getting sick. They’re much more potent than probiotics which lose potency out of the fridge for too long. The cultured veggies are fine unrefrigerated for a day, and then back in the fridge when you get to your destination. For the full low down on fermenting your own veggies and getting started, head here. Pack a few herbal tea bags. It took me a long time to admit that tea and coffee on an aircraft are both revolting and I was just saying yes for something to do! Prepare ahead and BYO! As an aside, why does it always get turbulent when tea and coffee are served? Every time? Without fail? It’s weird. Consider traveling with a high quality green superblend to mix with your water, if you’re on a really long flight. Make a trail mix of your favourite treats – activated nuts, pumpkin seeds, dried berries, cacao nibs. Pack a tin of sardines or mackerel (apologies to the guy next to you!) and half a lemon and seed crackers. My new favourite, cheap and easy up-in-the-air meal. Exercise as much as you can – even if you look like an idiot! I blow up like a puffer fish in the air if I don’t keep moving. Every couple of hours I do a few scissor twist jumps, lunges, plain jumps, squats and if it’s a 747 / A380, a bit of downward dog time. Yes, people laugh, but I’m feeling good at the end of the flight, despite the tiredness, and that to me is all that matters. Drink minimal alcohol. A glass of wine to relax and unwind with a movie is fine, and if you’re a spirits drinker, switch the sugary / juice mixer for soda water and fresh citrus as the mixer. Sugar is inflammatory and we don’t want any more inflammation than is already caused by flying. Consider taking a natural anti-inflammatory product such as some homeopathic arnica tablets for any stiffness or swelling. 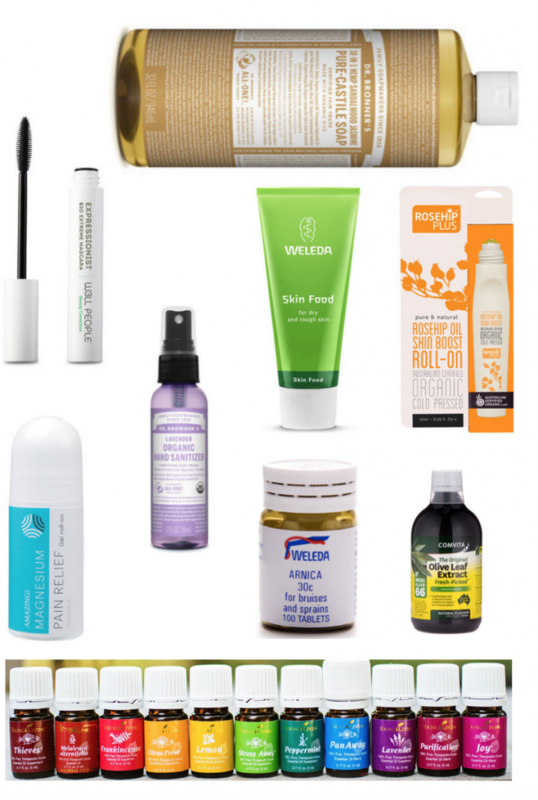 Use your low tox face wash to wash your hands too – The toxic stuff in the airport and air plane bathrooms is not good news and the last thing we need while under already very unnatural conditions, is to be hit with phthalates, triclosan and parabens. Get a tourmaline necklace. I have a big tourmaline block at home for it’s electromagnetic protective effects. It lives next to our wifi modem. I tried wearing it for the first time this trip on the flight back. Truth be told, it was something I saw at Dubai duty free and after 16 hours of travelling and before a 14 hour flight? Well let’s just say that if there had been a product made from recycled paper that promised me wellbeing while flying, I’d have bought it. I put it on. It was very warm to the touch after take off, and then cooled right down after landing. Spooky. I also felt physically far less swollen than usual and just wonder whether this little disc might have played a roll. Researching for another post on this for the next couple of weeks but the product information said it was excellent for circulation and oxygenating the blood and I genuinely felt much better than usual after a long haul. Lots of food allergies in the family? Probably best to get an apartment so you can shop and cook and not have to be upset if there are limited options for you. Being upset on holidays is no fun! While it might seem it, I don’t feel OCD at all while traveling. I have a gluten allergy, so for that alone with the average airport / plane offerings, one has to be prepared so one doesn’t go hungry. I eat normally in a restaurant, except deep fried to avoid GM oils and vegetable oil in general and I do a little research on ethical options and delicious places I want to dine in in advance, so I don’t have to take chances on quality factor and waste money on crappy foods. I don’t worry too much about whether produce is organic while I’m away, but if there’s an organic option, then sure, that’s what I go for. Fresh and local is my focus and all the flight stuff is with the motivation of arriving tip top healthy, in shape and ready to go, as opposed to loaded with processed foods and swollen like a michelin man and needing to lie down for 2 days. Who’s got the time for suffering, when you’ve arrived in the amazing NYC? Thanks Alex! Love this podcast! Am travelling to India in September and am going to use all of your tips. Wondering how you got on with taking a glass water bottle (with filter) and glass jars for food? Is the cup you take glass, or hate to say it… plastic? Thanks!